The 2017-18 NBA season has been one of the more exciting ones in recent memory. From surprise rookies (looking at you, Donovan Mitchell and Kyle Kuzma) to a competitive race for number one in the Western conference, this season has seen many a different storylines. Along with that, a fair share of roster shakeups has been brought to mainstream attention. For instance, Eric Bledsoe tweeted his way out of Phoenix and landed in Milwaukee. After signing a max deal and saying he wanted to be a Clipper for life, Blake Griffin now resides in Detroit. But both deals were nothing compared to the fire sale that the Cleveland Cavaliers pulled off, sending Isaiah Thomas to Los Angeles, dumping Derrick Rose off in Utah and - most importantly - seeing Dwayne Wade back in a Miami Heat jersey. Even with all those deals, there are still a few players that could use a change of scenery. Whether it’s to go to a winning situation or because they are slowly overstaying their welcome on their current team, the following players are probably hoping they could pack their bags sooner rather than later. The big man has had a decent stint in Washington. He’s formed one of the most devastating pick and roll tandems along side John Wall. However, it seems as though there have been some miscommunication and misunderstandings between the team, with the biggest tension coming from the little and big duo. Some comments through the media and Twitter started a small fire that was apparently put out with a sit down but with fans getting restless with the team’s stagnation, Gortat seems like the name that will get the ticket out of the nation’s capital. It was very close but Kawhi just misses the main list. Recent reports say he is feeling more and more pain free and could rejoin the team soon. 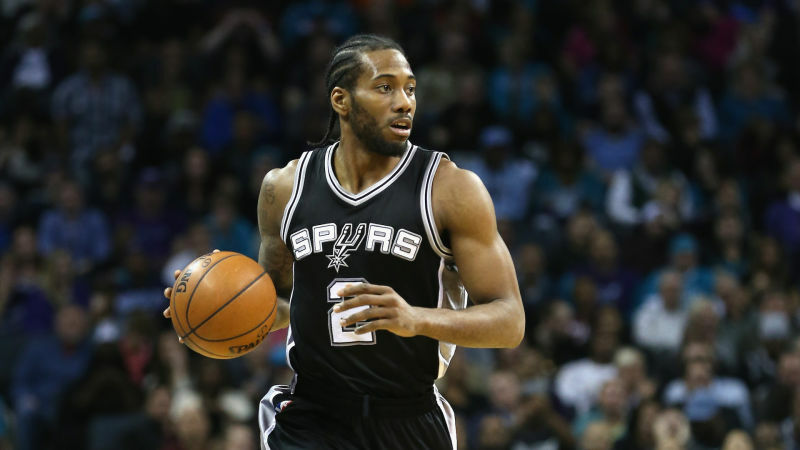 But that report comes roughly a week after Coach Gregg Popovich said that he would be surprised if Leonard returned at all this season. There has been something brewing in San Antonio and even though it is not quite a red alarm, it’s getting dangerously close. I promise you this has nothing with my hope that he comes to the Lakers (besides, that comes later). It’s not that Paul George is playing bad. In fact, he had a dominant stretch right before the All-Star break. The issue here is that the dynamic with Russell Westbrook isn’t quite working the way I think everyone hoped. Paul George was a dynamic player before joining the Thunder and currently he just feels like a really good player. I think going to a team where he can spread his wings again would be a good idea for George. Two years DeAndre Jordan was faux-kidnapped and after one of the greatest Twitter moments of all time, he chose to stay with the Clippers versus going to the Dallas Mavericks. There was promise that he, Doc Rivers, Chris Paul and Blake Griffin could finally get over the hump and break through the ceiling. Fast forward and his two co-stars have moved on to different teams while his coach is sure to be gone after this season as well. Lob City is dead and Jordan really has no reason to stay beyond the lure of Los Angeles. He’s still great defensively and is an elite rebounder (second in the league) and I’m sure there are plenty of teams that would love to have his skill set. Why not make a wrong a right and go to Dallas? Even though they are set for a rebuild, they’ve got some nice pieces and have a glaring hole in the middle that Nerlens Noel isn’t working out. The Atlanta Hawks, for my money, is the worst team in the NBA. But not too far off from that race is the Phoenix Suns. Defensively, they are a joke and offensively they don’t quite gel like they should. Most of the young pieces they’ve drafted have yet to reach their potential. But the one bright spot for the team has been the brilliance of Devon Booker. He continues to prove that he’s one of the best young players in the league. I just hope the Suns don’t think that he’s going to be a lifer. Booker’s talents are being wasted right now. He deserves to be on a team that has a competent front office. Personally, I see a future where Devon Booker is a Golden State Warrior but that involves one of the Big Four to leave and that could take a while. So in the meantime, I could see Booker finding a spot on the Thunder, getting open shots from Westbrook’s paint penetration. Now this one comes with slight reservation. Anthony Davis has been playing out of his mind lately. He’s got the Pelicans positioned to be a 3 seed in the West. A 3 seed! He’s a MVP candidate this year and if he would have my vote if the season ended today. And this is all without Demarcus Cousins for the remainder of the season! Everything is going so well, which is exactly what worries me. The last time the Pelicans did well, it convinced Anthony Davis to sign an extension and then he has toiled away ever since. My fear is that what has been happening is more anomaly than norm and the team will shift back to its losing ways. Also, as much as I love Demarcus Cousins, it looks like Davis is finally functioning at a higher level as the clear number one. They could easily just not re-sign Cousins but I think Davis could really do well in a different city. Imagine, Anthony Davis in Washington running the pick and roll with fellow former Kentucky Wildcat Wall. Speaking of a player who has been playing out of his mind, Damian Lillard has been on a mission ever since Westbrook made that quip about “people whining about getting snubbed.” He’s been on a tear as of late and to be honest, I didn’t think Portland was going to make the playoffs this year. And yet there they are, being led by the fiery point guard. He has zero fear no matter who he is playing against. The issue here is that he must do so much for his team to win. In two of his last few games, he’s had to put on herculean performances just to beat the Suns and the Lakers. He shouldn’t have to put this kind of effort in to beat two of the lower teams in the West. He isn’t old by any stretch of the imagination, but he is getting up there. Dame Dolla deserves to be in a better winning situation or at least in a situation where he has some younger, more dynamic pieces around him. A team like the New York Knicks would benefit from his presence immediately but if I love the prospect of him finding his way to Philadelphia. That big three of Lillard, Simmons and Embiid would immediately become one of the most feared in the Eastern Conference and the NBA as a whole. So, look, I am highly critical of Lebron James. The reason for that (I think) is because some of his fans believe he can do no wrong. They have an excuse for any fault that he may have and that gets annoying after the first response on Twitter. But don’t get it twisted: I recognize that Lebron James is one of five greatest NBA players to ever pick up a basketball. He could easily remain in Cleveland, continuing to dominate the Eastern Conference with an iron fist and realistically have a shot at being the all-time leading scorer. But with that probably comes a few more losses in the Finals. But he’s home in Cleveland and that should matter for something right? When Lebron came back, he said he wanted to bring a championship to Cleveland; he didn’t say he wanted to start a dynasty. He didn’t give a remix of his infamous “Not 1, not 2, not 3…” speech. He simply said I’m trying to bring one to Cleveland. He did that. As far as I’m concerned, he’s fulfilled his commitment. He doesn’t really like Dan Gilbert since his first exit from the team. As much as the story of him playing the rest of his days in Cleveland has a great feel good story, there is absolutely no reason Lebron James should be racking up Finals losses. The Houston Rockets would look pretty much unstoppable if they were to add Lebron James. Golden State no longer would have the mythical easy road to the championship and you have to think that if Houston can make it out the West, the championship is all but guaranteed without a Lebron James guarding the East. Rockets are probably the best option for LBJ. Or the Lakers. You know what? Nevermind. Lebron, join the Lakers.